Odd bits of strange, unexplained phenomena turn up in the field from time to time, nothing to get overly excited about, but definitely weird stuff, like this case of mysteriously removed row cover. Earlier in the day, I noticed the cover on one section of risk crop squash was off, thought Conall had removed it, but found when I walked over that about two-thirds of the 50′ (15m) sheet had been ripped off, and lay, bunched up, about 10′ away. In the pic, you can see the remaining piece, perfectly in place, and above it, an adjoining covered row that hasn’t been disturbed in the least. The cover is 14′ wide, and while not hard to tear, isn’t easily sheared right across like that. There’s been no heavy wind in the last few days. There are no footprints or animal tracks in the bed. How did this 35’x14′ section of row cover, anchored by burying the edges every few feet, and with heavy rocks at the corners, manage to detach so cleanly?! It’s a mystery! Thats weird, we had something similar happen to us a while back on our plot. 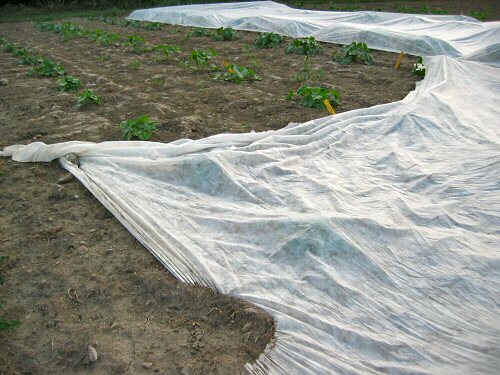 Part of our plot was covered in a thick black plastic. One day we arrived to see a large semi circle of the plastic missing. It was though it had been cut with a knife. I went through every thing, wind, animals, kids but it was too much of a clean cut for any of the above to be involved in removing this perfect semi circle. Anyways its still a mystery to this day. I’ll keep checking back to see if you find the cause of your missing row cover. That is too weird…That stake wouldn’t have anything to do with it, would it? Dave: Those two yellow stakes are suspiciously positioned, but I’m quite sure that’s just a coincidence. They’re 12″ wooden plant markers, I write varieties and dates on them. They snap easily, and they’re pushed in only maybe 3″ into loose, recently tilled soil. They’d topple over or pull out with the slightest pressure. They look a little tilted, but it’s interesting that they remained standing through whatever happened.